Phase 1 Calendar – Didn’t miss a day! 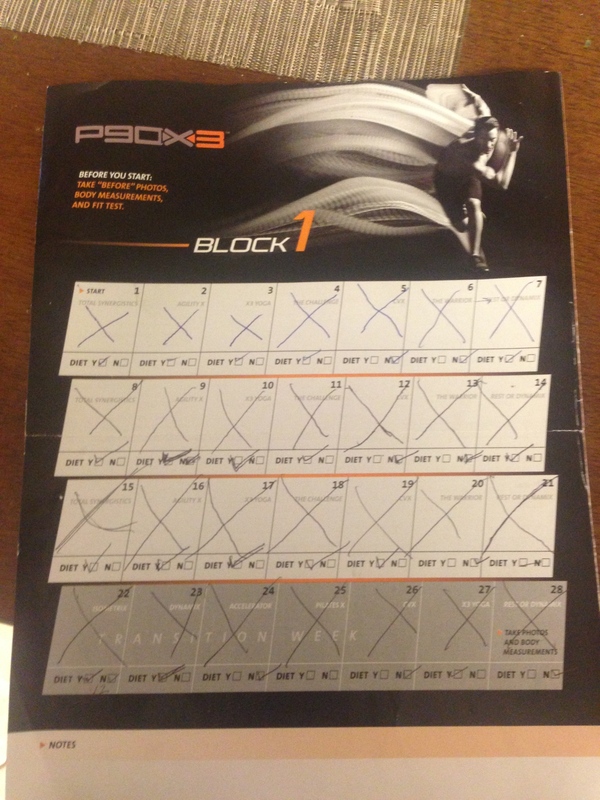 We finished P90X3 Phase 1 just about a week ago and so far I really like it! The 30 minute workouts are a much more manageable than P90X’s average of 1 hour 15 min, yet it almost feels like you get just as good of a workout in with 45 fewer minutes taken from your day. The shorter workouts also make it easier (though still not easy) to fit in half marathon training (plus half assed triathlon training) at the same time. P90X3, just like P90X is split into 3 phases (4 weeks each for the first two, 5 weeks for the final phase). Unlike P90X, however, P90X3’s phases are actually pretty different from one another. P90X had 6 workouts per week, but out of those 6, 4 of them repeated every single week, no matter what phase you were in (other than recovery week). The only workout you’ll do in P90X3 every week is Yoga, so there is a lot of variety! P90X3 Phase 1 seems to be getting you ready for the more focused workouts in the later phases. Instead of focusing a lot on one body part at a time, each workout seemed to incorporate the entire body. There was quite a bit of cardio and balancing in order to get the heart rate up and work the core in every workout. The only two workouts without cardio were Yoga and The Challenge (push-ups and pull ups only). 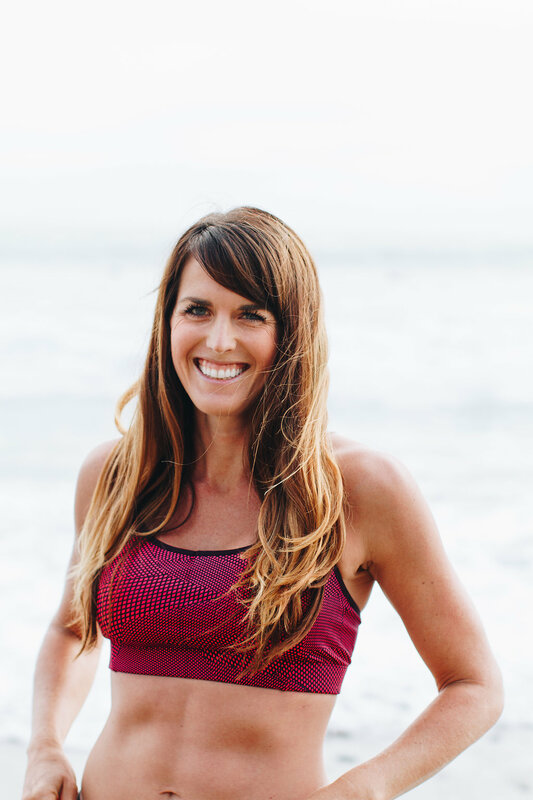 In general, my heart rate was high during all the workouts, including Yoga and the Challenge, as even those workouts are fast paced with very little recovery time. Total Synergistics- Full body fast paced strength routine which includes push-ups, pull-ups, crunches, planks, and squats. Although not technically a cardio routine, your heart rate will be high and you will start sweating quickly! Hardest Move: Branon Boat – In boat position (yoga move), with both torso and legs at 45 degree angle, begin to lower and lift your legs 4 times, while keeping torso stationary. Next, keeping legs stationary, lift and lower your torso 4 times. Repeat. Agility X – High intensity cardio with lots of quick movements and changing directions. Squatting, lunging, running, shuffling, jumping and even some dynamic push-ups – you will sweat! Hardest Move: Squat Jump Lunge – Bend both knees, squat down and back, and explode off the ground. Upon landing, cross your right leg over your left and lunge to the side. Squat jump back and repeat on opposite side. X3 Yoga – The least zen yoga you will ever do, as Tony moves through a ton of moves quickly and talks the entire time. The workout starts with sun salutations and vinyasas and quickly moves into crescent pose and all the Warriors with vinyasas between. It moves straight into a few balance postures before transitioning into stretching. The 30 minutes flies by and there is no time let your mind wander. Hardest Move: Twisted Moon – Balancing on right leg, place the left arm on the ground in front of your and twist your torso to face the right, with hips and left left leg parallel to the floor and right arm reaching up. The Challenge – 4 types of pull-ups & 4 types of push-ups, each repeated twice. Start with a pull-up move, move to a push-up, repeat the same two moves and then move on. The goal is to pick a number of push-ups and a number of pull-ups and do the same amount for all 8 sets of each. At the end there is a “Burnout” session where you basically do as many alternating push-ups and pull-ups as you can. I am so exhausted by the end that I just hold plank because I can’t physically do any more push-ups! Hardest Move: Military Push-Up. CVX – Cardio with a weight, formatted as three moves which are completed and then repeated with higher intensity the second time. The weight adds intensity and also adds in upper body sculpting, particularly in the shoulders. Hardest Move: Traveling Tire Twist – Lift your knees in a high knee run, moving forward as if you were jumping through 4 tires, while twisting your torso to bring your opposite elbow toward your knee (while holding a weight). The Warrior – A full body sculpting and cardio workout, very similar to Total Synergistics but with none of the same moves and a little more cardio. I was not expecting this to be so cardio intense the day after CVX but I was very sweaty by the end! The moves include variations of push-ups, speed skaters, crunches, planks, lunges, squats and burpees. Hardest Move: Super Burpee – In a sumo squat, jump back into a plank, then do a push-up and side arm balance on each side. Jump your feet back into the deep squat and jump off the ground into a tuck jump. Since there is less weight lifting and more total body moves in P90X3, at first I wasn’t sure what kind of results I’d get as compared to the original P909X. About a week and a half in I started to notice subtle changes in my body and by the end of the first phase, I definitely can tell that I gained muscle and lost fat. Since I’m not following the diet super strictly, there hasn’t been a lot of weight loss (I’m consistently about 2 lbs less than I was at the start) but my stomach feels flatter and my arms and shoulders are more sculpted. I feel like my legs are stronger as well. One of the challenges with doing P90X3 and running has been that there is more focus on legs than there was in P90X3, so my legs are often sore which sometimes makes running harder. However, I’ve been pleasantly surprised at times when I expected a tempo run to not go a well because my legs felt heavy yet it goes great. I think that the additional high intensity cardio and leg strength is helping my running and definitely not hindering it. So far, I’m loving the program and would definitely recommend it to fellow runners or triathletes who are interested in adding some strength in to their routine without an intense time commitment. If you want to join me, purchase P90X3 here (or on the banner on the side of this blog): http://www.beachbodycoach.com/esuite/home/fitnessfatale (click shop Team Beachbody or the banner for P90X3) and I’ll also be your Beachbody Coach! Which Phase 1 P90X3 workout sounds hardest to you? « FCA 5K – My First Win! Sounds awesome! I’m still amazed you’re following P90X3 and running a lot! Your fitness must be through the roof right now! The Challenge sounds SO hard each time you’ve written about it! This sounds awesome. What equipment is needed for p90x3? You need a pull up bar and weights plus a yoga mat, or just yoga mat and bands (can buy on Beachbody- the set includes a variety so you can use different resistance based on the move). I personally like the weights and pull up bar but the bands are good if you travel a lot (and is cheaper option).